Where once thousands of gold rush stampeders off-loaded tons of supplies, today's travelers arrive in Skagway on cruise ships, ferry boats, RVs or airplanes. Klondike Gold Rush National Historical Park invites you to explore this “Gateway to the Klondike.” This boomtown of 1897-98 offers colorful historic buildings, guided tours, and local characters that help bring this history back to life. Visitor Center and Museum: Your ticket to experience the gold rush starts at the visitor center on the corner of 2nd and Broadway in Skagway's historic White Pass & Yukon Route building. It is open from 8 am to 6 pm daily from May to September. Free ranger-led walking tours start from here every day. The park film, “Gold Fever, Race to the Klondike,” shows daily and highlights Skagway's rowdy and glorious past. Orientation and maps help you plan your visit. Next door, in the park's museum, visitors will find displays of gold rush memorabilia, historic photos, and a relief map showing the historic trails to the gold fields. Artifacts from the largest intact gold rush collection of original objects are on display. Donated by the Rasmuson Foundation in 2008, the George and Edna Rapuzzi Collection captures the flavor of historic Skagway and provides authentic connections to the past. Mascot Saloon: The Mascot Saloon, a fully-restored building on Broadway and 3rd Avenue, steps visitors back in time. 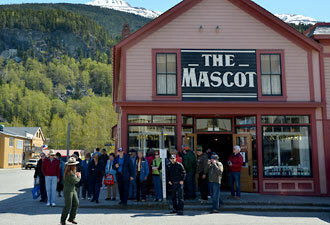 Known as the longest-lived single-owner saloon in Skagway, the Mascot is open daily from 8 am to 6 pm. In the fall of 1898, the Mascot was one of 43 saloons between Broadway and Main Street. Moore Cabin and Moore Homestead: Learn about Skagway's founding Moore family at this rustic site on 5th and Spring Street. Take a self-guided tour any day between 10 am and 5 pm to see the late Victorian period furnishings in the Moore Homestead. The nearby Moore Cabin is the oldest structure in town, built in 1887. Pantheon Saloon-Junior Ranger Center: The Pantheon, on the corner of 4th and Broadway, invites children of all ages to learn, protect, and explore through the Junior Ranger program. 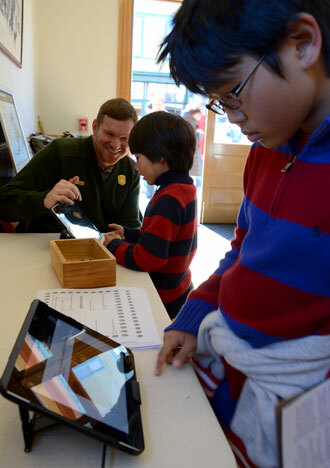 Junior Rangers who complete engaging activities, designed for ages 3-12, can earn badges. Family Adventure backpacks are also available at the Pantheon, open Monday through Friday from 10 am to 3 pm. The nearby First Bloom Garden, designed and planted by local youth, can be enjoyed by everyone. Jeff. Smith Parlor: On 2nd Avenue between Broadway and State Street is the headquarters of the infamous Skagway crime boss of 1898, Soapy Smith. Soapy controlled a gang of con men and thieves in Skagway until his death in a gun battle on the evening of July 8, 1898. The parlor museum is slated to open in 2016. 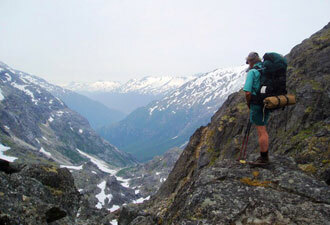 Beyond Skagway, the most challenging way to follow in the footsteps of the stampeders and native Alaskans is by hiking the 33-mile-long Chilkoot Trail. This difficult hike usually takes three to five days. The trail begins at the Taiya River bridge near the Dyea townsite and travels over the Chilkoot Pass to Lake Bennett. The Seattle unit of Klondike Gold Rush National Historical Park explores Seattle's crucial role as a starting point for the stampede to the Yukon gold fields. The Klondike's long and colorful history is waiting for you. Stroll the boardwalks and adventure into the mysteries of a gold rush boom town.